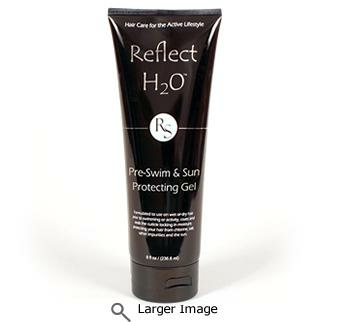 REFLECT H2OTM Pre-Swim & Sun Gel prevents chlorine damaged hair. This pre-swimming gel can be used on wet or dry hair prior to swimming or activity. Our pre-swim gel will coat and seal the cuticle locking in moisture, protecting your hair from chlorine, salt, other impurities and the sun. By using this pre-swim gel you will prevent the adherence of chlorine, salt, other impurities including copper deposits that cause green hair from chlorine. Our pre-swim gel also prevents sun damaged hair and tangles during physical activity. Do use prior to swimming. Do use prior to activity in the sun. Do coat your hair for superior protection. Do enjoy your your non-greasy protected hair. Don't get in your eyes. Don't ignore the needs of your hair, use REFLECT H2OTM! Protects hair prior to swimming or outdoor activity. Makes swim caps easy to go on. Coats and seals the cuticle locking in moisture. Prevents the adherence of chlorine, salt and other impurities. Repels copper deposits that can cause green hair. Defends against the suns UV rays. Prevents hair from getting tangled into a knotted mess during activity.